A shark measuring nearly 20 feet in length roamed the oceans 100 million years ago, according to a new study from Oklahoma University. Leptostyrax macrorhiza is reported to be "among the largest predatory animals of the Albian oceans". The creature is described based on three giant vertebrae unearthed from a block of limestone not far from Fort Worth, Texas, that is believed to be the remnants of a shallow sea from the Late Cretaceous period. The massive vertebrae measure more than four inches in diameter, roughly the size of a human hand. Besides its large size, little is known about L. macrorhiza. Researchers have yet to uncover anything but the three vertebrae. Sharks are typically identified by their teeth -- vertebrae are a relatively uncommon find. The three vertebrae, however, provided a foundation upon which the researchers were able to estimate the shark's size. 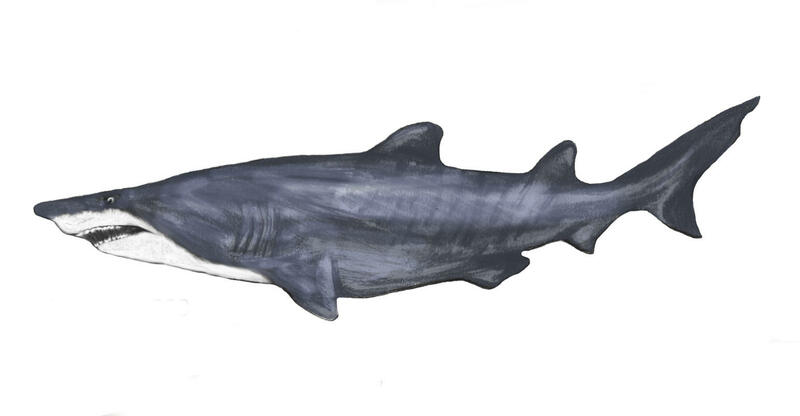 Although L. macrorhiza may seem large, it pales in comparison to Carcharocles megalodon, a 50-foot shark from the Cenozoic Era. A team of great whites hammer a one-man shark cage until a really big one shows up.